Saint Ephraim, before his tonsure into monasticism, was treasurer and steward of household affairs at the court of the Kiev Great Prince Izyaslav (Demetrius) Yaroslavich (1054-1068). Weighed down by this noisy and bustling life and wishing to become a monk, he was accepted into the Kiev Caves Lavra by Saint Anthony of the Kiev Caves and was tonsured by Saint Nikon (Mar. 23). The enraged prince demanded that Ephraim return, threatening to lock him up in prison and to destroy the Kiev Caves Lavra. Saint Anthony and the brethren left the monastery and decided to go to another place. Izyaslav, however, feared the wrath of God. He took his wife’s advice and withdrew his forces from the monastery in disgrace. 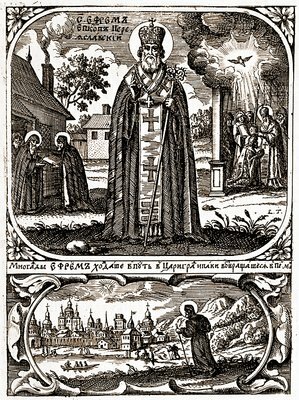 Saint Ephraim wished to go on pilgrimage to the holy places abroad. With the blessing of Saint Anthony, he journeyed to Constantinople and settled there in one of the monasteries. 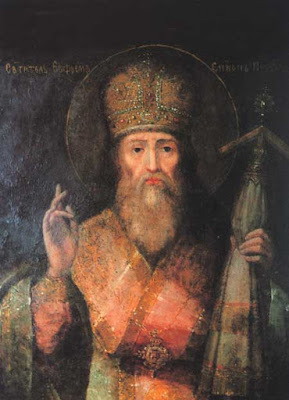 While in Constantinople, Saint Ephraim made a copy of the Studite monastic Rule, and took it to Kiev at the request of Saint Theodosius of the Kiev Caves. 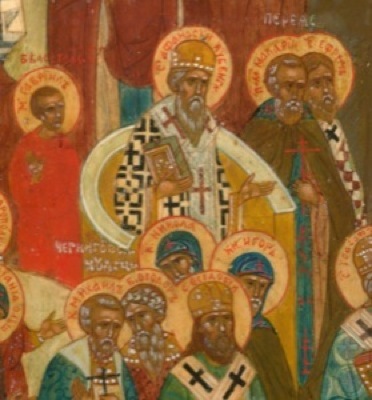 As soon as he received the Rule, Saint Theodosius implemented it in his monastery. After the year 1072 Ephraim was made a bishop in Pereyaslavl, with the title of Metropolitan. He adorned Pereyaslavl with many beautiful churches - such as Archangel Michael's Cathedral, the Church of Saint Theodore and the Church of Saint Andrew the First-Called - and public buildings, and he built stone walls around the city in the Greek manner. He built free hospices for the poor and travelers, and constructed several bath-houses, that is, he was the first Russian to construct special buildings where a font was set for the baptism of adults. Saint Ephraim died in the year 1098. 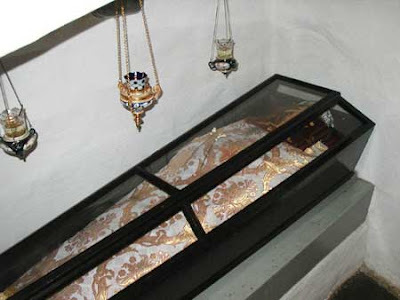 He was buried in the Far Caves of the Kiev Caves Lavra.